In Michigan it has been a law since April 10, 2006, that building and homeowners must install a smoke detector in any structure constructed before November 6, 1974. Homes after this date have to comply with the codes of the individual cities. Based on the size of your home, and the number of potential fire hazards, you should have at least one detector in every occupied bedroom and for each level in your home including the basement. You should also choose the right type that best fits the needs of your home. There are two main detector types, and each has a sensor that detects smoke and fires differently, depending on how the fire is starts. The first smoke detector type, ionization alarms are generally more responsive to a fire that has started, according to the National Fire Protection Association. These alarms use “ions,” or electrically charged particles, to help detect smoke in the air. Ionization type units are slow at detecting slow-burning fires, which are caused by the most common types of fire starters such as lit cigarettes, bad electrical wires, and fireplace embers. 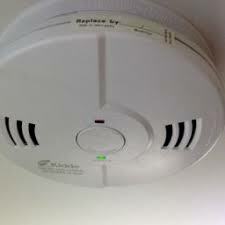 The second type of smoke detector is photoelectric, which uses a light beam to help detect the presence of smoke. According to NFPA, these alarm types are more effective at sounding when a fire originates from a smoldering source, like a lit cigarette that falls into a couch cushion. Smoldering fires may fill a home with dangerous gases before a fire ever erupts. Each Smoke Detector will detect fires differently. A more expensive option if you have trouble deciding is to purchase a smoke alarm with dual-sensor devices. These detectors combine both ionization and photoelectric technologies in a single unit. Most smoke alarms come equipped with a noise alert to let you know when their battery is low. The general rule is to stick to changing out the batteries annually. You should change or check your batteries during daylight savings time. You should replace your detectors every ten years. The different type of Smoke detectors can be found on Amazon.com for a reasonable price. Finally, you should also read about How to choose the right fire extinguisher for your home.